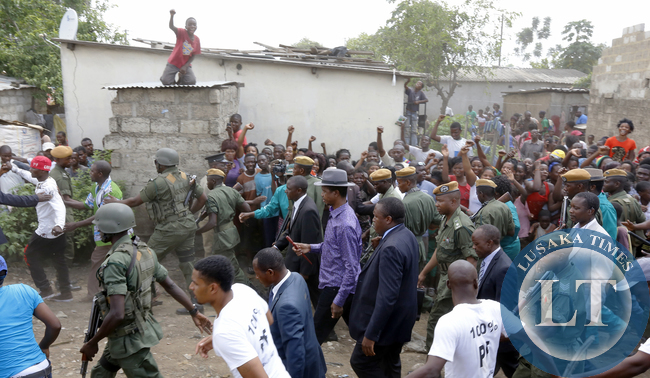 FILE: President Mr Edgah Lungu Walking in Misisi compound after Commissioning Misisi Police Post. PICTURE BY EDDIE MWANALEZA/STATEHOUSE 21-02-2015. PRESIDENT Lungu is today expected in Solwezi on a three-day working visit to North-Western Province. President Lungu is expected to arrive at Solwezi Airport at 10:00 hours. This is according to a tentative programme released by the provincial administration in Solwezi yesterday. The President is expected to break ground for the rehabilitation of the Solwezi-Chingola road at St Dorothy at 11:00 hours and will later commission works for the rehabilitation of township roads in Solwezi. President Lungu is also scheduled to inspect the Solwezi fuel reserve depot. And President Lungu is tomorrow expected to be conferred with the status of free man of the town of Solwezi. President Lungu will later tour Mushindamo Girls Technical Secondary School on Solwezi-Kipushi road before departing for Kasempa. President Lungu is expected to commission the NATSAVE bank branch in Kasempa and meet freedom fighters. On Saturday, The President will travel to Zambezi and Chavuma for a ground-breaking ceremony for the construction of township roads and is expected to return to Lusaka the same day. President Lungu was recently in the province during which he met victims of landmines and witnessed the defection of United Party for National Development vice-president Richard Kapita to the Patriotic Front. And RESIDENTS of Kasempa are today eagerly waiting to welcome and have a glimpse of President Lungu, acting district commissioner Mercy Kambita has said. President Lungu is today expected here to launch a 9.2 kilometre stretch of urban roads and the K3.5 million NATSAVE bank branch in Kasempa. Ms Kambita said in an interview yesterday that ever since President Lungu assumed office, there has been a shift in people’s view of the Patriotic Front (PF). She said residents now view the PF under President Lungu’s leadership as a party to reckon with. “We have been overwhelmed with people from the United Party for National Development requesting that this office facilitates their defection to the PF but as you know this office is non-political. Our role is to serve everyone regardless of their political affiliation. This, to me, shows the shift in people’s attitude towards the PF,” Ms Kambita said. And Ms Kambita said her office is overwhelmed by requests from residents for Government to prioritise construction of Kasempa-Mumbwa road under the Link Zambia 8,000 project because it has economic value than the others earmarked under the same project. She said Government plans to work on the Kasempa-Kalulushi road and the Kasempa-Kaoma road under the Link-Zambia 8,000 project but residents want the Kasempa-Mumbwa road to be worked on first. “Under its current status, it is two hours to get to Mumbwa from here. This means if the road is worked on, people can literally be shopping from Lusaka on a daily basis. This will make the cost of living in Kasempa cheaper. “These are some of the requests the people of this area want our President to consider, Ms Kambita said. Meanwhile, people in the area have been demanding to know why there are no beneficiaries of the social cash transfer scheme. “Kasempa, despite being the food basket for the North-Western Province, is a rural and poor district and people are wondering how Solwezi could be benefiting from the social cash transfer while the poor elderly women of this place are denied help,” Ms Kambita said. I am a firm PF cadre, but my suggestion is ; SIT in the office and work MR President. You can’t be in the air every week, swearing in every week. We have ministers to commission works. Nowadays on ZNBC Tv news, the first story is …. President ECL…… Second or third story …… Easter Lungu…….. Very boring news indeed. Are they the only news makers in a land with more then 20million people. Its not about white wash. These are some of the benefits of having a credible opposition. The ruling party is kept on its tolls. At the end of it all, its the general citizenry that will benefit. North western and western provinces were the most neglected. Cant wait to drive on the Mumbwa – Kasempa road. At least President Lungu unlike his predecessor has a heart for NW Province. President Mwanawasa (MHSRIP) was the first Zambian president who really wanted to develop NWP. President Lungu should try to take development to all the areas of Zambia that were neglected by the previous presidents. Haters….. President sits in his office, No Ba President just sits in his office, President goes around checking and commissioning projects, NO Ba President never sits in his office. Let’s give the guy a chance he is on the right track. I don’t like Zambian politics of late because ruling parties are too busy campaigning for elections at the expense of strategizing and organizing the country for effective & durable development. This piecemeal approach to national development is cheap (but effective in cadre mentality) way of enticing uneducated poor voters. The down side of this approach is that our country will miss the opportunity to advance into the elite group of countries of this century with accelerated growth rates. Hes travelling and holding swearing in ceremonies too much.He is overdoing it.He should be in office mapping out for the future of this nation economically instead of flying all the time.This what happens when one doesnt know what to do.Just going all over the places which is also a cost drainer. Planning does not need one to be confined in the office. As you interact with people and the environment you get ideas and ‘sleep’ over them so that the following morning the idea becomes a subject matter for cabinet discussion. I think we have working president in state house. He hounded out Sata cadres from ZRA, ZESCO and many other quasi-govt institution leaving only professionals. This is good. His appointments cut across all national regions. This is commendable too.We all have an obligation to encourage him to be on the ground to get things crunking, otherwise he’s gonna be fed mouthfuls of untruths. God bless Edgar and let him not collapse so soon. Thank you for remembering NW province. Tunasakalili mwani. People living overseas should feel embarrassed for failing to support their own heritage but are busy praising and looting what the white man sweated for. Sometimes we need to feel ashamed of ourselves . insoni ebuntu. Learn to appreciate a developmental step your country takes because this is how America was also developed. America wouldn’t have been like that of clowns like you who opposes and politicize everything were present. Be proud of your country and leaders. Congrats hard working ECL! !this is how a president must be.he works hard everyday.his good works has worried ZWD and UPND too much! !ZWD thinks they can make bemba speakers hate PF and president Lungu-NEVER! !MAJORITY BEMBAS SHALL EVER VOTE FOR PF THAN TRIBAL HH! !PLUS UPND MUST WORRY THAT ECL IS NOW ENTERING N/WESTERN AND WESTERN.ONCE PEOPLE KNOW HOW GOOD ECL IS IN THESE 2 PROVINCES,THEN HH WILL BE FINISHED BCOZ UPND WILL NEVER WIN IN BEMBA SPEAKING AREAS AND EASTERN! !HH’s only hope in 2016 is winning in Southern,Western, N/Western and part of Central! !SO ECL HAS DONE WELL BY BREAKING INTO N/WESTERN AND WESTERN!! !